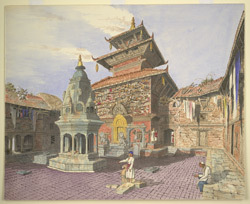 Watercolour of a Vihar (Monastery) at Chobar in Nepal, by Henry Ambrose Oldfield (1822-1871), dated July 1857. The image is inscribed on the reverse: 'Interior of a Vihar in the town of Chobbar. July 1857'. Dr Oldfield, who was Residency Surgeon at Khatmandu from 1850-1863, wrote in 'Sketches from Nipal, Historical and Descriptive...' (1880): "[vihars] are double-storied and usually built in the form of a quadrangle. In the centre of this quadrangle there is always one chaitya [prayer-hall], and in some vihars there are several. On the north side of this central chaitya, opposite the shrine of Amoghasiddha, is a small tank or basin...There is also always a shrine containing a figure of Sakya Singha in the quadrangle, and a pair of reliefs of Ganesha and Mahenkal at the entrance of every vihar...Although surrounding Buddhist shrines and containing within their limits many sacred objects of Buddhist worship...at the present day they are merely secular establishments or corporations...institutions merely for the encouragement of trade, and not for the support of religion...In the town of Chabbar there is a large and curious vihar called Chob Vihar. On the south side of its quadrangle is a four-storied temple, the basement of which contains a shrine and large figure of Sakya Singha. The front of this temple is covered with goods and chattels and other personalities of deceased Buddhist Niwars."